The City of Chicago has a residency law that is designed by the Mayor of Chicago to keep a well oiled political machine in place for election time. Many of the unions have a bizarre relationship with Daley, they are there to skim money off the top of worker’s paychecks and then deliver a percentage to the current Administration. They call this a symbiotic relationship; it is like those fishes that attach to the sharks. 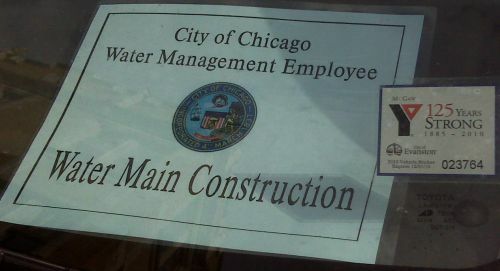 Chicago has system that mixes private contractors and municipal employees. The idea is to play the two sides against each other to increase the production, keep friction, and increase management power over both sides of the equation. I would say without a doubt Mayor Daley and his entire Administration have failed the taxpayers at this game resulting in complete and total chaos. Today I had to call the police on a car with City of Chicago vests and City of Chicago employee identification. One could certainly make the assumption the card in this picture was issued by the Department of Water Management. The owner of the car illegally parked in an intersection blocking traffic, both pedestrian and automobile. The owner of the car was responding to a pulled water service. The owner seemed to assume he had some rights reserved for City employees. I called the Commissioner’s office and the Office of the Inspector General. This is theft of City property or false impersonation from my experience. I really hate, really f-ing hate when a private contractor assumes they have the same privileges as city workers. They do not have background checks, drug tests, and pay union dues to the same extent. The owner of this car told me he is not a City employee. Lucky him, he is Mark St**ge, he lives allegedly on Lincoln Avenue, not in Chicago, but in the suburbs. Are you glad Mayor Daley allows these people to live outside the city when Chicagoans have no work? I made a report with the CPD today on the incident. If you are out of a job in the construction industry and you live in Chicago, I would be really mad. If you work for the City of Chicago, put your kids in private schools, and get furlough days, I would be mad. If you are Saul, fighting for your job on a residency beef, I would be really, really mad. Photo by Patrick McDonough. Why is it that everybody blames the Mayor for all the problems we have in the city? He can’t do alone.The real problem is that these Aldermen are all going along with him, they all are getting something to sell out the people of Chicago. parts of the city to the Mayor’s friends. should be removed from office. your friend John Doe! (Response) Run for office, win or lose, you win. Pat I would have to agree with the last post. A lot of the things king Richard does he would not be able to do without the council approval. And with all of the layoffs of employees from the CTA and city departments what happened to the talk about Chicago not needing 50 alderman I would like to see that disscusion to come back. A man posing as a Chicago Fire Department inspector stole more than $500 from a Downtown athletic club Saturday morning. The man entered the Lakeshore Athletic Club at 211 N. Stetson Ave. about 8:30 a.m. and told the staff he was a Chicago Fire Department inspector, police said. The club’s Illinois Center location is open from 8 a.m. to 6 p.m. on Saturdays, according to the facility’s Web site. Police News Affairs Officer Daniel O’Brien said the man deceived the staff and stole more than $500. He told staff the facility was in violation of fire codes and issued “fines” that staff members paid in cash, police said. It was not clear if all the stolen cash was from the “fines” or if he also stole money from other locations. The imposter is described as a 55- to 60-year-old “clean-cut” man, O’Brien said. He was about 6-feet tall and wore a blue coat with “Chicago Fire Department” on the back, a gold cap and blue jeans. Fire department investigators do not usually conduct inspections on weekends – except at night at bars and nightclubs, Fire Media Affairs spokesman Quention Curtis said. Police said there was a similar incident Downtown about a month ago where a man posed as a People’s Gas employee. Police did not know if the incidents were related, and did not provide further details on the People’s Gas incident. Curtis said anyone unsure about the legitimacy of a fire inspector should call 911. (Response) We warned the city about this stuff. Next PostNext Notable websites for Chicago Clout Fans Disabled Cops.